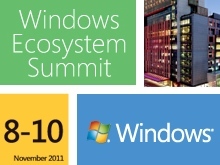 The Windows Ecosystem Summit is a training event hosted by Microsoft for the hardware ecosystem, in Taipei, Taiwan. At the event partners can learn about the reimagining of the Windows 8 platform and how these changes have created new opportunities for hardware partners. The training content provides information that will help partners to develop and test Windows 8 ready systems and devices. By watching the sessions, partners have the opportunity to listen to Microsoft subject matter experts and learn how to best prepare their systems and devices to create the most exciting PCs and Devices yet.